Think I've had a bit of a growth spurt!!! Emphasised by the huge amount of stirfry I've just eaten! Anyway, had our 20 week scan today. Baby is still doing well. All measurements were good apparently. Was a bit hard to work out the bits the Sonogropher was telling us at first as she was going down through the body from head to foot but then she zoomed out and showed us the various parts of the body. We saw its little feet and toes. It got hic-cups at the time too - strange I can't feel it when it has hic-cups yet. However, I do feel it move lots. It takes after its father there - a bit of a fidget! We got photos again but I need to get them scanned in. My BP is still high, more so than normal and the midwife told me to book an appointment with my GP asap - bit worrying now, I think they are going to put me on medication. My urine is still showing up clear of any protein though which is good so no other signs of pre-eclampsia. Well, if anyone can name what they 'loved' about pregnancy, please enlighten me. 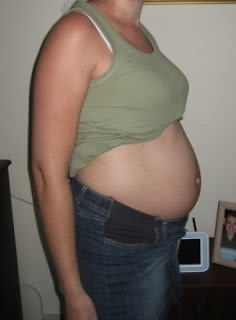 To finish, here are some piccies of my bump to keep you going until I get the scan pictures scanned in. 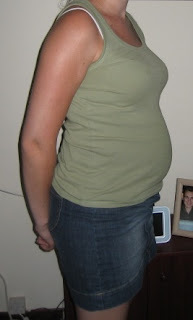 Why does my stomach look so much bigger when it isn't covered?